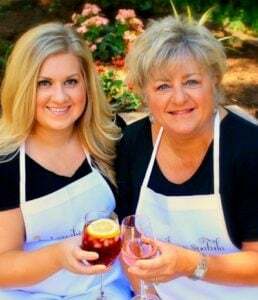 We love to cook with orzo around here! It’s a great change up from rice and cooks in half the time. Perfect for quick skillet dinners and it’s a great canvas for a host of flavors! Need a quick and easy side dish? Than Orzo is your friend! Sounds like an old Italian name doesn’t it? “Ciao Orzo! Hows the Famiglia?” I always thought I had a little Italian in me. I mean I feel it ya know? This constant craving for pasta and googling Italian phrases, and then there is my crush on Orzo…I’m telling ya, if it wasn’t for that damned family tree trashing my dreams…. You can certainly toss in whatever you have hanging around to veggie up the dish. Red peppers, green onions, zucchini…even add in cubed chicken for a one pot meal! 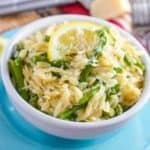 A quick dinner made with lemon and asparagus. Toss with some chicken or shrimp and you have a whole meal! Add Orzo and cook until slightly tender. About 10 minutes. 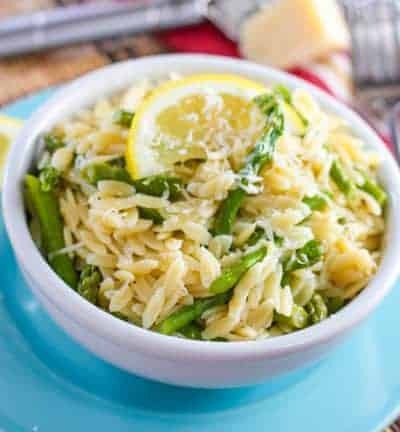 Toss asparagus into water with the Orzo. Continue to cook another 2-3 minutes until asparagus is fork tender. Drain and pour pasta and asparagus back into pan. Add lemon juice and zest, parmesan and butter. I made this and thought it was very bland. Followed the recipe Definitely needed something else. How many cups does this recipe make and how many will it serve? Hi Debbie! It makes about 6-8 cups. It’s a pretty big bowl of it when it’s all done. I updated the recipe with the serving sizes. Thank you! I love orzo. Good thing the Whole30 is over, tee hee. Pinning this so I’ll have the recipe when the asparagus in my garden is ready. Maybe being Italian is all in the heart? Pretty sure we got us some heart!